Though they may seem to be a minor component of an outfit, socks are anything but. Case in point: would you wear rainbow polka dot socks to a job interview at a law firm? Not if you want the job. There are a few different rules and regulations when it comes to your hosiery. As with anything clothing-related, it’s best to start by obeying these rules (especially in conservative situations) and bending them as your sartorial muscles begin to strengthen. The rule of thumb is that sock color should match or very closely match the color of your trousers. If nothing else, you will be dressed correctly and inoffensively by obeying this rule. On the other hand, you might not have that much fun. As socks are often patterned, typical pattern coordination guidelines apply. Below, we explore the various outfits with which we can pair socks. Keep in mind that all of these suggestions are subject to your environment and that common sense, good taste, and your audience trump everything. When wearing socks with a suit, color choice should be dictated by your environment. If you’re in a business professional dress code or wearing a suit to a funeral, you should absolutely wear grey socks to match your grey trousers. On the other hand, if you’re on a date or just wearing a suit for fun, you can coordinate your socks with another part of your outfit, such as your shirt or tie (more on that below). There’s one incredibly important thing we have to mention before moving on; when wearing a suit or any outfit that involves a dress trouser, it is imperative that your socks are long enough to keep your legs covered up while you’re sitting down in addition to standing. 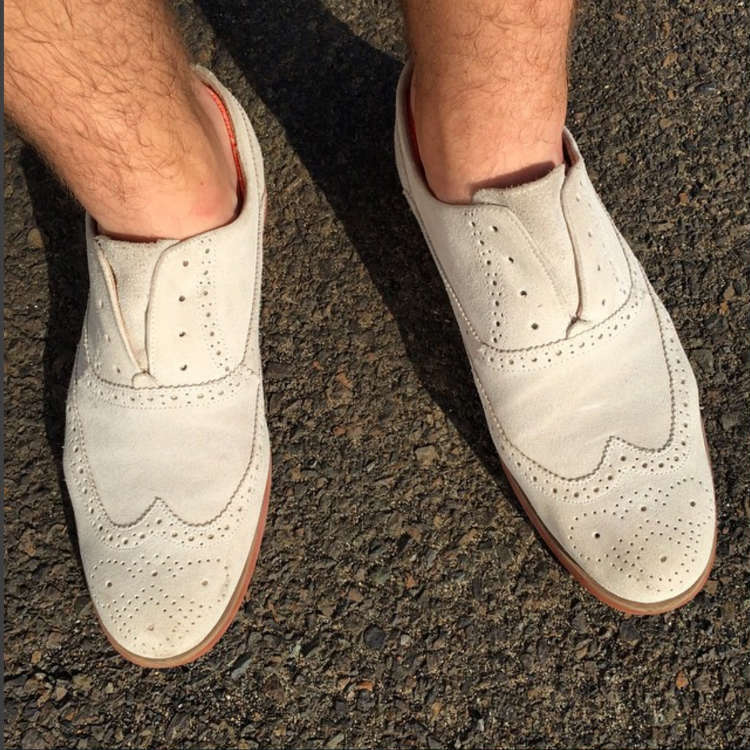 While the sockless look has been a thing for a few years and will likely continue to be a thing, if you’re wearing proper socks, they must be long enough. Jeans allow you a ton of wiggle room as it relates to your socks. You can obviously wear the same color socks as your denim (that is, some shade of blue), but the casual nature of a pair of jeans is such that you can wear basically anything you want when it comes to socks. Consider coordinating with your shirt, sweater, or sport coat by mirroring one or more of the colors. This will obviously require you to be well-read on the topic of color, and we have a color guide that’s very helpful in that regard. Though there’s a bit of variation allowed with tuxedos, a true black tie ensemble calls for black silk hosiery. If you’d like a bit of design, they may have clocks on the outside of them. If you’re wearing a tuxedo in a creative black tie scenario, you can get away with a more boldly designed sock, but we still suggest keeping the colors dark and rich as you would a cummerbund or vest: deep plum, burgundy, forest green, and the like. If you’re wearing socks with shorts, they should be no-show socks (or pedis, or man-peds, whatever you like to call them). The shoes one would wear with shorts will look good with no-show socks, and anyone who lives with you will thank you for having worn some kind of sock after you get home and take your shoes off. The only real exception to this is if you live in Bermuda and are wearing the national garb of Bermuda shorts, shirt & tie, blazer, and dress shoes with over-the-calf socks. Under no circumstances whatsoever should you wear the tube socks-with-sneakers-and-shorts ensemble seen on so many middle-aged fathers. It is truly atrocious. As it happens, you should not match your socks to your shoes. We opt to match socks to trousers instead of shoes because matching them to shoes will produce a boot-like look when you’re not, in fact, wearing boots. It’s not a sartorially smart decision to make. Of course, this changes when your shoes happen to match your trousers. 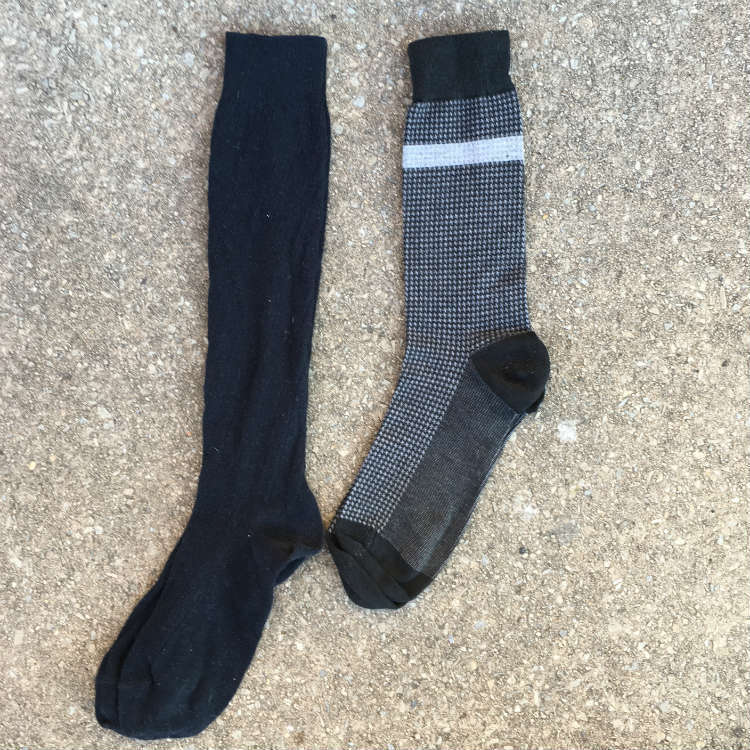 If these two items are the same color, then yes, you can match your socks to your shoes. Coordinating the colors of your socks and tie is a very smart move that, when pulled off well, lends continuity and closure to an ensemble all at once. In this case, “matching” really means “coordinating.” While you can certainly wear deep purple socks in the same shade as your deep purple tie, these items are too far apart from each other physically to look unstudied. A better choice would be a lavender sock with plum tie, electric blue socks with a navy tie, or yellow socks with green dots paired with a forest green tie. You’ll want to know all about complementary and monochromatic color schemes to pull this off well. Click either of the preceding links to get more information on those topics. Coordinating your socks with your shirt is another thing you can do to add some color and general fun to your outfits. The same guidelines apply that we use for coordinating socks with ties. Not all socks are created equal. There are many different styles to suit various occasions and personalities. We should probably start with “no socks” as an option. The obvious choice for flip-flops and slides, going sockless with regular shoes is less desirable. Our personal experience has seen insoles being ripped out as they stick to your feet when taking shoes off, terrible odor, and general physical discomfort. Unless it’s the summertime and you’re wearing sandals or espadrilles, opt for some kind of sock. No-show socks came on the scene for men over a decade ago. Originally only available in white and black, they’re now available in as wide a range of colors and patterns as regular socks. This is perhaps confusing as the whole point is that they don’t show, but then again, underwear comes in a a bunch of different colors too. Invisible socks should cover the soles or your feet, your toes, and the bottom of your achilles tendon, but not much more. Again, the whole point is to be able to wear them with any shoe and still appear to not be wearing socks. These are an excellent option for warm weather and work with shorts and jeans. There is much rancorous debate over whether or not these are appropriate with suits. Our opinion is that common sense should make that call, and common sense is based on who your audience is going to be and the sartorial environment you plan to be in. Wear proper socks to a funeral in the summertime. If you’re a guest at a daytime summer wedding, though, feel free to throw on some no-show socks with that natty suit of yours. Athletic socks are completely appropriate for athletic endeavors. Typically hitting just above the ankle, their colors tend to be limited to white, black, grey, navy, or combinations thereof. Do not wear athletic socks with dress clothing. Further, wearing athletic socks will alter the fit of your shoes, so make sure that you wear proper socks when shoe shopping, too. Bold socks have been de rigeur for years now. Anything goes in this realm: rainbow camouflage, multi-colored stripes, bold dots, you name it. They’re available in a wide variety of materials and lengths too, so you can always find something to suit your needs. You’ll want to be careful about pairing these with your outfits. This isn’t to discourage you in any way, but rather to hammer home the fact that you’ll look your best when you’re thoughtful about these kinds of socks. Either coordinate them strategically with another part of your outfit, or wear a simple, monochromatic outfit and have your socks be the pop of color and / or pattern you need. Check out our guide to the best places to buy crazy socks for men online where we show you our top picks for men’s fashion socks. Dress socks are really the only appropriate socks for wearing a suit in a more formal environment. If you’re in government, law, or another sartorially conservative industry, you’ll want many of these socks. The only colors you’ll likely ever need are grey, navy, black, and perhaps olive and brown. Grey and navy are even a part of the ever-important capsule wardrobe. As we mentioned above, make sure that these are long enough to cover your legs even when seated. This brings us to our final two categorizations: crew and over-the-calf socks. Below: Over-the-calf socks on the left, crew socks on the right. Note the significant difference in length. As it relates to socks, the word “crew” is an indicator of length. Specifically, it refers to any sock that hits at approximately mid-calf. Crew socks are made in all different styles and are perfectly appropriate for more casual applications such as denim, chinos, and even odd jackets and trousers. Over-the-calf socks (also known as “OTC” socks) are absolutely your best option when suited. The name is self-explanatory; the socks are long enough to go “over the calf.” This length ensures that your bare leg will never be visible, and better quality models will hug the calf so as to do an even better job of staying up. Just about every pair of socks available on the market today will have some kind of stretchy material in its fabrication; Lycra, Spandex, or something of that nature. Keep that in mind as you continue. Cotton socks are the most common type of hosiery around. Thin cotton ones make for great dress socks while thick ones make for great casual socks. While cotton is breathable, it has a low moisture absorption rate (only 8% of its weight), so it can get soaked through easily in inclement weather. Merino, cashmere, and other types of wool socks have a wonderful feel and are excellent at keeping feet warm. Wool is breathable and can absorb up to 30% of its weight in moisture, so you can be sure that your feet will stay dry under most conditions. As an aside, there’s no feeling quite so luxurious as having your feet cushioned by cashmere all day long. Try it sometime. Silk socks are generally relegated to the world of black and white tie ensembles. They are elegant and comfortable, but they’re expensive and have to be washed on a delicate cycle. Most men have one or maybe two pairs that they wear for each formal event they have to attend. Sometimes, socks get tired. We’ve all been there: you’re out and about and your socks have lost their elasticity, so you’re constantly pulling them up. We call these socks “quitters,” and there’s a solution: sock garters. We’ve written at length about sock garters (“suspenders” for our British readers), so click the preceding link to learn more! Your socks could be seen as a minor detail, but to paraphrase Alan Flusser, minor things often carry major importance. We hope this guide has been helpful to you and solidifying your style. For more on men’s style, see our style home page. Greetings, I have a question. The white pair of low cut athletic socks featured on your page; what brand are those socks? Thank you! I’m sorry to not be of much help as I don’t actually know the brand of the socks used by the original author. However, I can recommend M&Z no show socks. I’ve used a few pairs and they’re really great!